Touring, off-road and racing are popular activities around the world. Important considerations are, ergonomic fit of the body with the bike, preventing traumatic injuries in collisions, preventing overuse injuries, and proper training for intensity and volume. Bicycling involves anaerobic and endurance intensities. Rider is usually on heavier, low gear bikes with big tires and upright handlebars. Course is hilly and/or bumpy. Criterium events often have prizes (known as primes, usually cash or bicycle accessories and attire) for winning specific intermediate laps (for example, every 10th lap). Criterium athletes require a mix of good technical skills such as the ability to corner rapidly and sharply in a large group of cyclists in tight spaces on a short circuit. 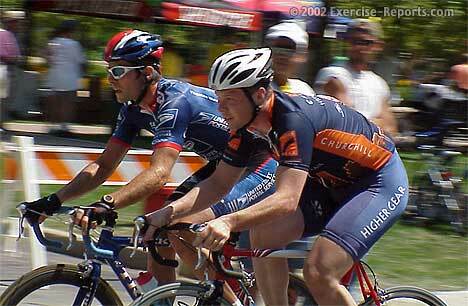 Exceptional cardiovascular and anaerobic threshhold fitness to pass other riders and accelerate hard on corners. Off-Road race where rider wins with the most laps on a one or two mile rough terrain course. Road races may involve both team and individual competition ranging from a one-day road race, criterium, and time trial to multi-stage events like the Tour de France and its sister events which make up cycling’s Grand Tours.